Utagawa Kunisada/Toyokuni III (1786-1865) Yosaburo and Otomi, 1858. Oban. 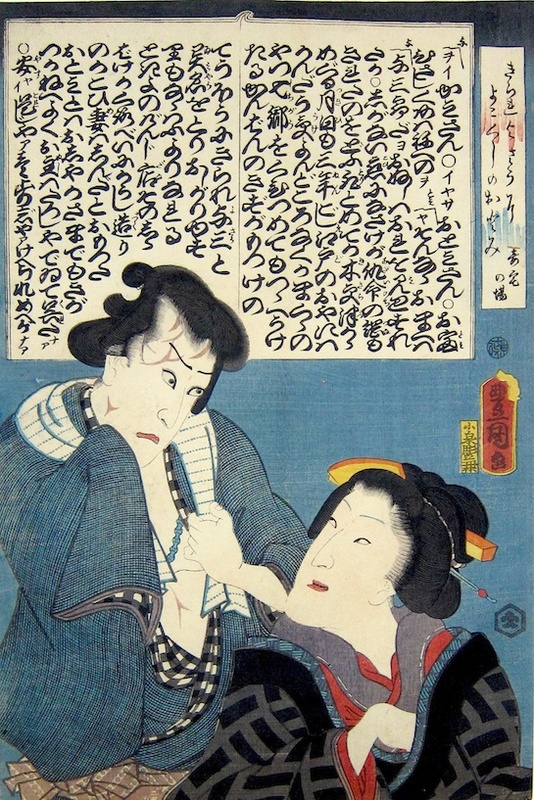 This a scene from a classic play Kirare Yosa (Scarface Yosa) in which Yosaburo falls in love with Otomi, the mistress of the gangster Akama Genzaemon (see also Otomi in the Yoshiwara). When Akama learns of the affair he has Yosaburo slashed all over his body and thrown into the sea. Otomi is rescued by a clerk and set up in her own house in the town. Yosaburo, now known as Kirare Yosa, survives and becomes a petty criminal, breaking into the house of Otomi in error. She doesn’t recognise him because of his scars, but he proceeds to persuade her in one of the finest speeches of kabuki theatre. The lovers are eventually reunited and Yosa’s scars are healed by magic. This print depicts the scene where Yosa and Otomi are reunited. The print is full size, embossed and burnished with only minor marks and flaws. Overall very good.